As you may know Moldova influenced a lot of my wine tasting and I can often be seen on the wine trails with some of my friends from Moldova, well Americans I met there like Dan, Debbie, Megan & Scott. See we were all bound together in a crazy family commonly known as "the Peace Corps." Family can be hard to avoid, leave or permanently ignore in general. Add that to living in a place where bathing is weekly and indoor plumbing is rare that familial bond fuses. We look out for each other and stick together as much as we might frustrate each other from time to time. One of my friends from those Peace Corps days, John, took his introductory knowledge of house wine making from Moldova back to California, expanded his education more formally and began making Bottle Jack Wines. 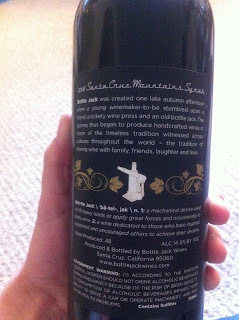 His first batch of wine from 2008 was bottled in 2011 and includes 3 varietals: Firenze, Zinfandel & Syrah. Since us regular Virginia wine tasters are in DC and John and his wife Katharine (yet another Moldova alum) are out in Santa Cruz we ordered his wines and requested a Skype date to have him walk us through his varietals. We started with the Firenze, an 86% Sangiovese blend with 10% Petite Sirah & 4% Zinfandel. This was a very smooth wine aged in French Oak, as we learned Sangiovese tends to be acidic which cleanses the palate and why it is so good with pasta. Dan, who spent a year in Italy, gave it two thumbs up. Next we were on to the Zinfandel, I was a bit of a skeptic when it came to the Zin, but I was pleasantly surprised by its peppery taste. This was Megan's favorite as she enjoyed the tart kick it had, also French Oak aged. Last, but not least was the Syrah, which may have been the over all favorite. It was aged in new American Oak which really brought out a wonderful vanilla nose and taste. We concluded that it would be great with a steak, but you could also enjoy it on its own. All of these wines are bold, distinct reds, which is what I really like. Much bolder than a lot of the reds we try at young Virginia wineries, but since John is a relatively new winemaker I was really curious as to how he achieved such distinct flavors. Was it the age of the vines? Is it the California climate? Is it the type of barrels used? After asking John some follow-up questions and browsing through my Virginia notes I came to the conclusion that it is all of the above. Virginia (typically) gets a true winter and is humid in the summer. California and more specifically Santa Cruz where the Zin & Syrah are from have rocky, sandier soils that drain well from their slopes. The Firenze which comes from Gilroy which isn't too far from Santa Cruz has a similar mild, climate. The vines producing Bottle Jack grapes are probably a couple years older than those at younger Virginia wineries. In addition to enjoying a glass, learning something new by asking these types of questions is just another reason why I enjoy the wine tasting journey. Not only are Bottle Jack wines quality wines, they are also sustainable; the wine is bottled in reused bottles from Wine Bottle Renew, the labels are tree-free made from a blend of bamboo, cotton & bagasse, plus they don't use foil capsules which all adds up to a lot of natural resource savings. The Zin & Syrah are fairly close to being organic as well, the only exception is an occasional sulfur spraying they do to keep mold at bay. We all enjoyed the wines so much and catching up with John & Katharine, we're getting ready to place another order. If you like reds and decide to give Bottle Jack a try, you won't be disappointed! 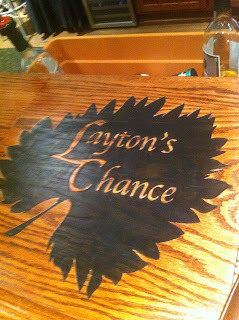 Our second stop in Maryland was about 40 minutes east of St. Michaels, Layton's Chance Vineyard in Vienna, MD. It popped up not far from the water and surrounded by farmland. 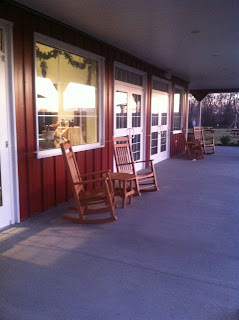 It was very peaceful with rocking chairs on the front porch. We were the only guests, but had apparently just missed a big crowd. The tasting room was well decorated with local pottery, other crafts and wine knick-knacks. Our two hostesses were very friendly and told us quite a bit about the property. We learned that they made their first wine in 2009 and since they are still building their vineyards they have bought some of their grapes from other MD and NY vineyards. For $3 we tried 8 wines and the wine frappe. Layton's Chance is on Lazy Day Farm which is an 1800 acre working farm, owned by the Layton family. They have their signature concord grape wines which are sweeter and they call the "beer drinkers wine," Joe's Cool White and Joe's Cool Red both with 8% rs and 12% alcohol. As a (dark) beer fan myself, perhaps these should be called the light beer drinkers wine. I did like their red version of Joe's slightly better than St. Michael's Gollywobbler. As for the rest of the wines we all liked the 2010 Traminette the best, the Chambourcin was made with NY grapes but it was a bit more tart than I like my Chambourcin to be. They had the sweet wines well represented with a Lazy Day White (4% rs) and Lazy Day Rose in addition to Joe's wines. In the summer they serve a sweet Watermelon Wine which is a local favorite, unfortunately they were sold out so we were not able to try any. This vineyard seemed to fit the Eastern Shore with their light sweet wines for summer time sipping. While enjoying a glass we had some local cheeses from Chesapeake Bay Farms and we fell in love with their smoked cheddar! Since we were so far from home we asked our hostesses for dinner recommendations and they pointed us in the direction of the Hot Spot Cafe in Cambridge. We also adored this spot! We had the best surf & turf...all the surf was amazing your choice of shrimp, scallops or crabcakes and since there were 3 of us we got to try all three. Delish! Maryland Has Wine; And It's Good! Virginia has wine so why wouldn't its northern neighbor, Maryland, have wine? That was my question while in Annapolis last weekend while supporting a friend as she participated in the Polar Bear Plunge. Thank goodness for smart phones because a quick Google search told me that Maryland does have wine on the eastern shore! 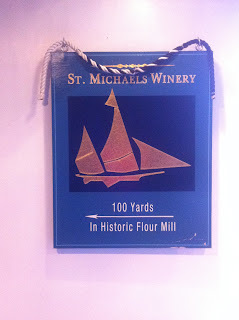 Unfortunately the Maryland Wine website is not nearly as easy to navigate as the Virginia Wine website, but I was able to find one about 40 minutes east of Annapolis, St. Michaels Winery in the historic town of St. Michaels "the town that fooled the British." I had Megan and Debbie in tow and we made our way to the tasting room, which was behind a brewery and around an old flour mill. The tasting room was packed! It seems it was the last day to redeem a Living Social deal there so it was full to the brim and the staff was working hard. We were originally told it would be a 20-30 min wait for a tasting, but some friendly tasters who were finishing up made room for us at the main bar. 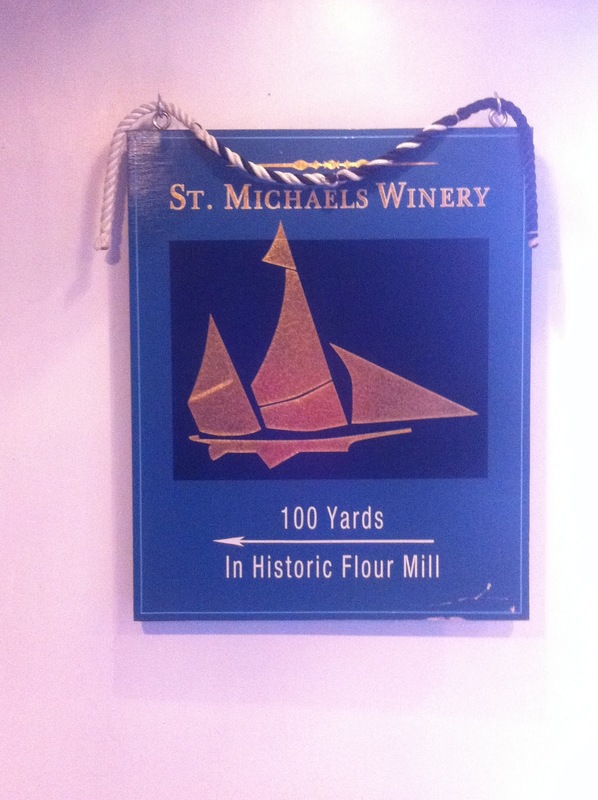 There we were greeted by a friendly server who told us that St. Michaels has been making wine since 2005 and a lot of the Maryland wineries were taking notes from Virginia's growing industry. She also told us about the Maryland wine passport that has codes for each of the 50 wineries in the state; once you register yours you are eligible for discounts to tasting events, festivals and bottles. Virginia, you've got to get in on this! The tastings were a la carte and a $1 for each, if you tried more than 3 you got to keep your glass. We tried about 9 of the 16 available, they were sold out of an additional 4 wines. We all tried the same first 3, Long Splice dry white, steel barreled Chardonnay, and a steel barreled Viognier. The Long Splice, a seyval blend, had a very fruity fragrance and we all enjoyed the Chardonnay & Viognier. I went straight in for the reds starting with the Maryland Merlot, a smoky merlot that is grown on a former tobacco farm, followed by the Island Beauty which a wonderful smooth and dry red. The Syrah had a nice nose, but it was a bit too dry for my palate, that was followed by the Martha Chamborcin which was light and named for the Martha Skip Jack that brings the grapes down the channels. I finished up with the Gollywobbler Red, made from the Concord grapes that grow well in Maryland. While I was busy with these Debbie and Megan had skipped down to the off dry whites, the Pinot Blanc and St. Michaels White (vidal). Megan was head over heels for the Pinot Blanc which had notes of mint in it, a very refreshing cool white, also the wine makers favorite. Debbie tried it next and also loved it so I gave in and tried it as well, it was amazing! I mean you all know I'm learning to like more whites, but this was amazing! Lucky for us they were having a sale on whites, 3 for $10 so we walked out with a couple boxes of the Pinot Blanc, Viognier and Chardonnay. There was also a "bargain bucket" of wines marked down because of their imperfect labels and Megan jumped on the bottle of Pinot in there. 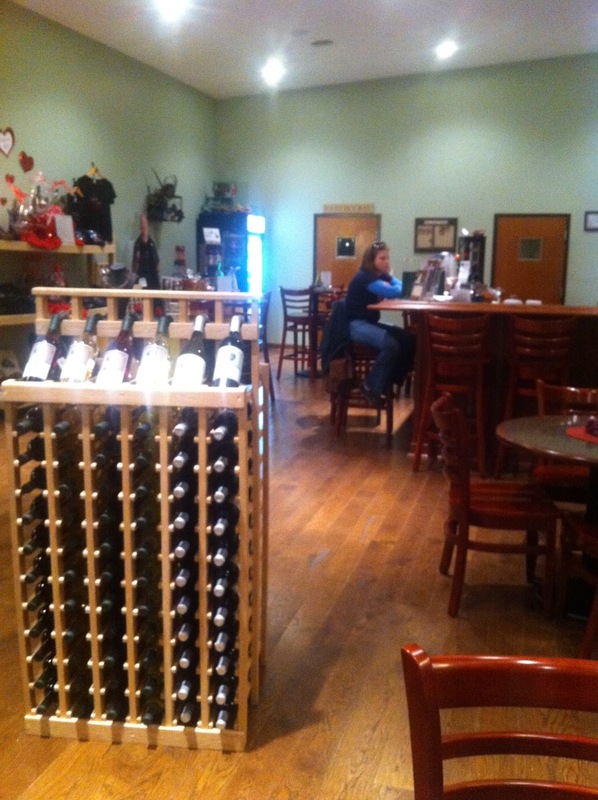 While the tasting room was a bit cramped, the service was great and the wines were wonderful! Next time you are heading out to Maryland's eastern shore make this stop for sure!